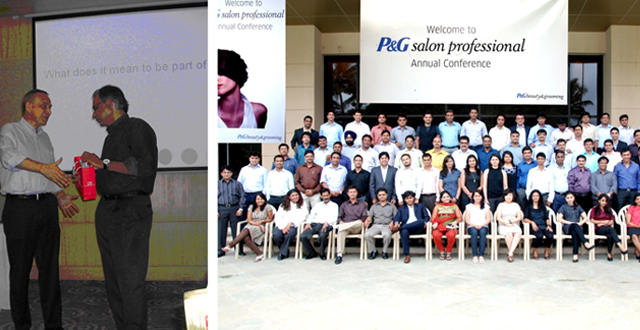 P&G is one of the largest and amongst the fastest growing consumer goods companies in India. P&G is one of the largest and amongst the fastest growing consumer goods companies in India. 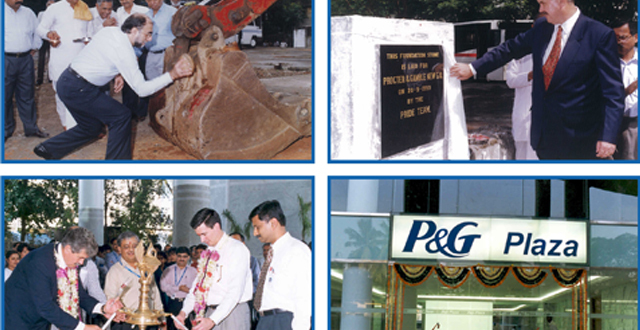 Established in 1964, P&G India now serves over 650 million consumers across India. Its presence pans across the Beauty & Grooming segment, the Household Care segment as well as the Health & Well Being segment, with trusted brands that are household names across India. These include Vicks, Ariel, Tide, Whisper, Olay, Gillette, Ambipur, Pampers, Pantene, Oral-B, Head & Shoulders, Wella and Duracell. Superior product propositions and technological innovations have enabled P&G to achieve market leadership in a majority of categories it is present in. P&G India is committed to sustainable growth in India, and is currently invested in the country via its five plants and over nine contract manufacturing sites, as well as through the 26,000 jobs it creates directly and indirectly. Our sustainability efforts focus on Environmental Protection as well as Social Responsibility to help develop the communities we operate in. P&G operates under three entities in India - two listed entities “Procter & Gamble Hygiene and Health Care Limited” and ‘Gillette India Limited’, as well as one 100% subsidiary of the parent company in the U.S. called ‘Procter & Gamble Home Products’. In 1964, a public limited company, Richardson Hindustan Limited (RHL) is formed, which obtains an industrial license to undertake manufacturing of Menthol and Vicks range of products such as Vicks VapoRub, Vicks Cough Drop and Vicks Inhaler. 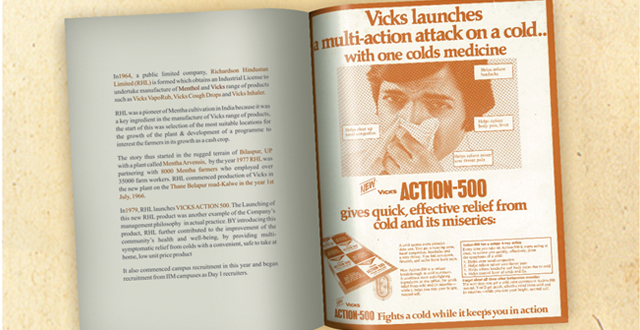 In 1979, RHL launches Vicks Action 500. RHL further contributes to the improvement of the community’s health and well-being, by providing multi-symptomatic relief from cold, with a convenient, safe to take at home, low unit price product. 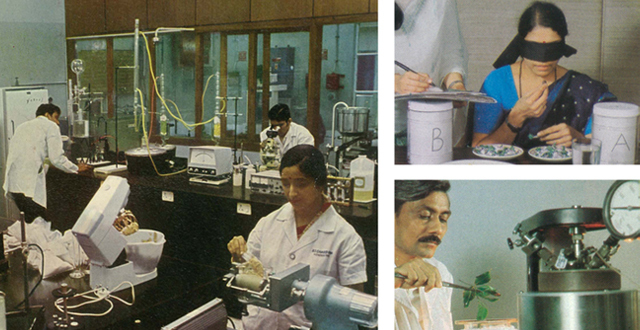 In 1983, RHL establishes a world-class R&D centre for Herbal medicines at the Kalwe plant to probe into the ancient herbal medicines, evolve products suited to meet modern needs, continuously seek ways to improve the existing products and create new products. In October 1985, RHL becomes an affiliate of Procter & Gamble Company, USA. RHL strengths were added to the formidable marketing & technical expertise of P&G’s business world wide, thus creating exciting synergy needs. 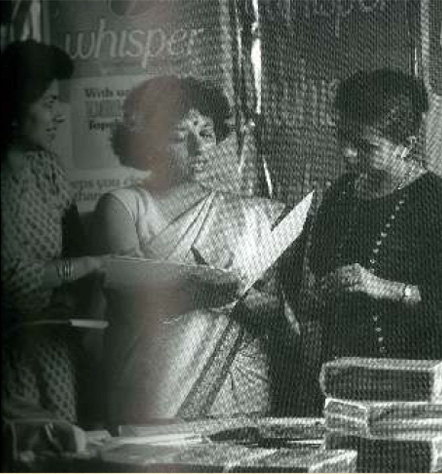 In 1989, P&G India, launches Whisper; the breakthrough technology sanitary napkin which revolutionized the Indian feminine hygiene category. The product was designed keeping in mind the personal hygiene of thousands of Indian women. 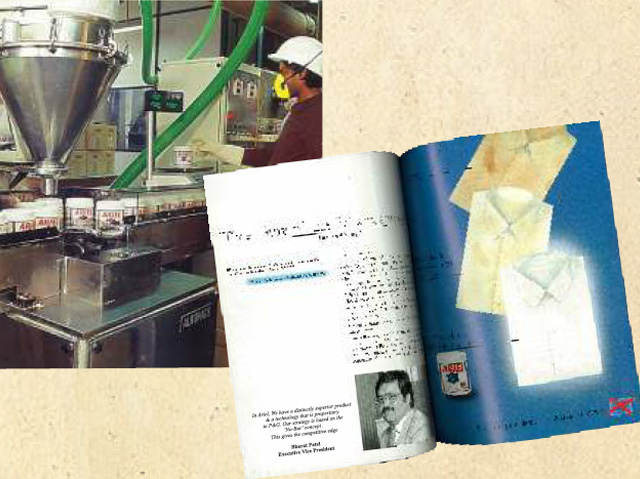 In 1991, P&G liberalized the Indian house wife through the introduction of ‘Ariel Micro System’. The years before Ariel, washing had been a long arduous process for housewives, involving back breaking labor. In 1993, P&G USA enters into a Joint Venture With Godrej Soaps in India & was named Procter & Gamble Godrej(PGG) to leverage Godrej’s scale & distribution in the Soaps category in India, however the JV for strategic business reason was dissolved in 1996. In 1995, Procter & Gamble Home Products enters the Haircare Category with the launch of Pantene Pro-V. 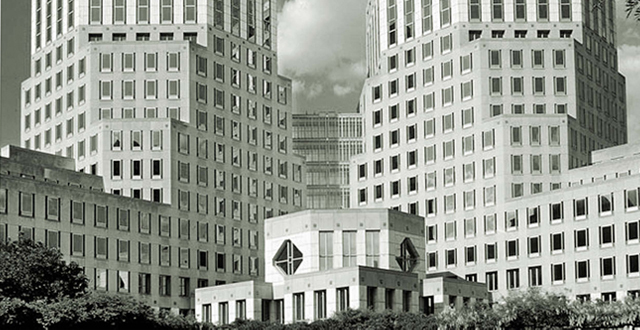 In 1995, P&G initiated the ‘Point Of Market Entry’ program. The Direct to Consumer (DTC) or Direct Marketing (DM) program followed with the launch of Ariel in India, brought P&G brands closer to its consumers. In 1997, Procter & Gamble Home Products launches Head & Shoulders shampoo. P&G India moves from Tiecicion House, to its new headquarters at Chakala, Mumbai. The building became functional in record breaking construction time – Just 27months! 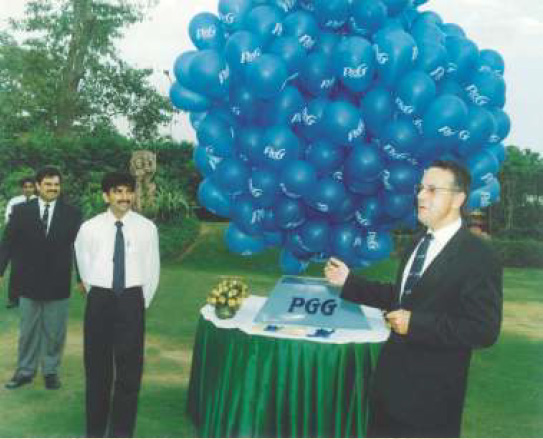 In 2003, P&G India gets Best Employer Award. Standing by the company’s credo of ‘Touching Lives’ and ‘Improving Lives’, P&G launches ‘Shiksha’ in 2004 in association with ‘CRY’. The objective of the program is to educate underprivileged children. In 2005, Gillette – P&G merger creates ‘The World’s Largest Consumer Products Conglomerate’. 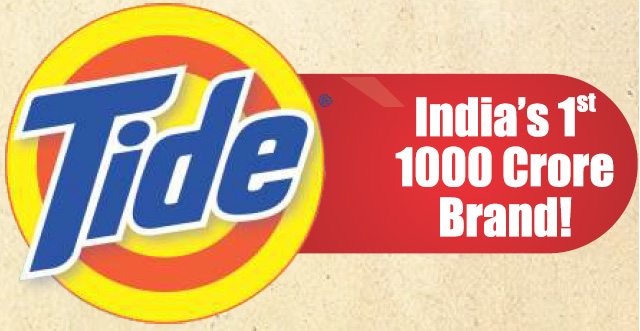 On one hand, for India, Gillette products could now ride on P&G’s distribution reach, and on the other hand, P&G India leveraged Gillette’s expertise in Modern Trade & Army canteen stores. 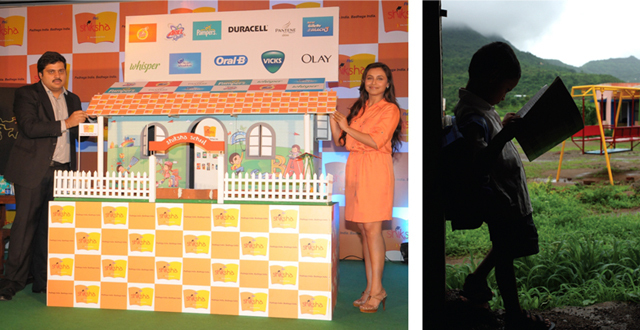 In 2006, P&G launches Pampers for it to be one of the most successful launches in the Indian FMCG history. Receives unique distinction of being amongst the fastest brands to reach the milestone of $100MM no’s in its 4th year since the launch. 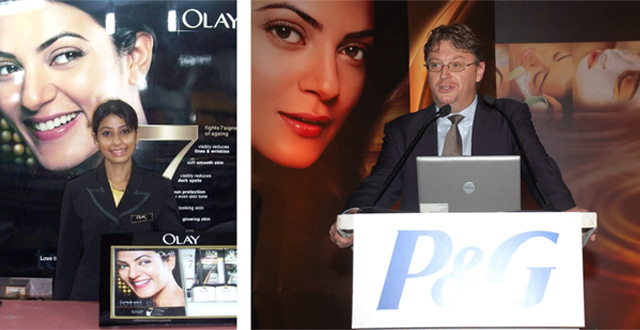 In 2007, P&G launches Olay with its premium Anti-Ageing line of products – ‘Olay Total Effects’. Within 4 years of its launch in the anti-ageing category, P&G establishes itself as the market leader and helps the industry reach the170crores mark. In 2009, P&G integrated Wella, Integration of business organization & Structure, Employee harmonisation in to P&G systems, benefits & policies etc. & laying the foundation of business systems & processes like Order, Shipping, Billing systems, Purchasing, financial data mgt & reporting.